Capt. 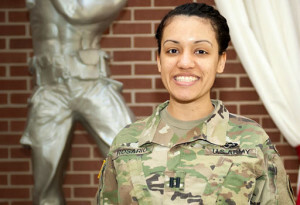 Monica Rosario, a cancer survivor, is at Fort Leonard Wood awaiting her pick-up for Engineer Captain’s Career Course. At age 25, Monica Rosario was diagnosed with stage three colon cancer, a diagnosis that would start her on a personal battle, not only for her future as a Soldier, but for her life. “When they told me, I felt very numb,” Rosario remembered. She was a first lieutenant serving as a company executive officer in the Warrior Transition Battalion at Fort Bragg, North Carolina at the time. 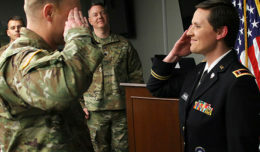 It never occurred to Rosario, now a captain at Fort Leonard Wood awaiting her pickup in Engineer Captain’s Career Course, that the reason for her frequent visits to her doctor could be so dire. Doctors kept telling her she was just dehydrated and needed to go home and rest. During one emergency room visit in January of 2015, however, a doctor inquired about Rosario’s frequent medical issues, and her responses prompted him to recommend a colonoscopy. Her mother and father, who lived not far away in her hometown of Fayetteville, North Carolina, accompanied her to the appointment. That’s when they learned it could be cancer. The diagnosis was confirmed at a follow-up exam. Rosario’s mentor and commanding officer at the time, Capt. Chinyere Asoh, said she understood what Rosario was about to endure. “I served as a commander and, each day, I heard news of Soldiers going through the worst unimaginable concerns of their lives, but I stayed strong for them and their families,” Asoh said. When Asoh heard the news her executive officer had cancer, she couldn’t hide the emotion. Rosario approached her situation from another perspective — one inspired by former ESPN anchorman, Stuart Scott, who fought a seven-year battle with cancer. Scott lost that battle in 2015 at age 49. “Whenever you are going through it, you don’t feel like you are doing anything extraordinary because you are only doing what you have to do to survive,” Rosario said. Rosario confessed that, while she was undergoing treatment, it made her uncomfortable when people called her a hero. There was nothing she was doing that made her special, she believed. “When you have to be strong and you have to survive, you don’t feel like you are doing anything special,” she said. The Army provided Rosario with the time and support she needed in order to devote herself to recovery, she said. Rosario said it took about two weeks to recover from her surgery before she could start chemotherapy. Following six months of chemo, it took another two months before she was able to resume her physical training. She fought hard to keep herself ready to return to full-duty so she could continue her career. Her will to fight was an inspiration to her husband. Rosario credits positive thinking and the support of her Army family for keeping her in the Army so that she could make it to Fort Leonard Wood to complete the Engineer Captain’s Career Course.